The Rescope Project is formally launching Carbon Civilisation and the Energy Descent Future at the 2019 Sustainable Living Festival in Melbourne next week. Sam and I will be joined by Dr Sangeetha Chandra-Shekeran, Deputy Director of University of Melbourne’s Melbourne Sustainable Society Institute. Sam and I will briefly introduce the book’s key themes, with Sangeetha providing context based on insights from her own research. Sangeetha will then moderate a conversation drawing on comments and questions from the audience. We’re very much looking forward to lively, though-provoking and engaged audience contributions along the lines of past Rescope Project events, and aim to squeeze as much opportunity for this as we can from the time available. Copies of the book will be available for purchase after the event for $25.00. If you’re in Melbourne, we’d be delighted to have you with us, and if you can, please help us spread the word. Full details are available via the SLF program at http://www.slf.org.au/event/carbon-civilisation/. I’m very pleased to announce the release Carbon Civilisation and the Energy Descent Future: Life Beyond this Brief Anomaly, co-authored with Sam Alexander. 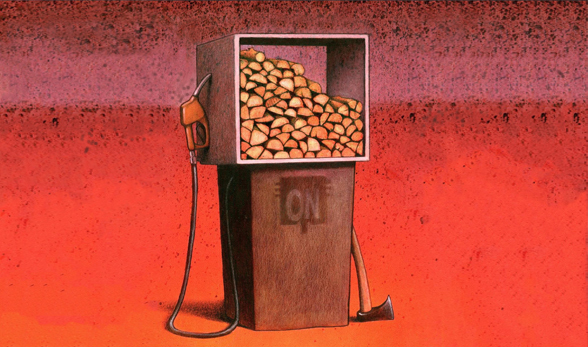 Carbon civilisation is powered predominately by finite fossil fuels and with each passing day it becomes harder to increase or even maintain current supply. Our one-off fossil energy inheritance is but a brief anomaly in the evolution of the human story, a momentary energy spike from the perspective of deep time. Today humanity faces the dual crises of fossil fuel depletion and climate change, both of which are consequences of the modern world’s fundamental reliance on the energy abundance provided by fossil energy sources. Can renewable energy replace the fossil energy foundations of carbon civilisation? 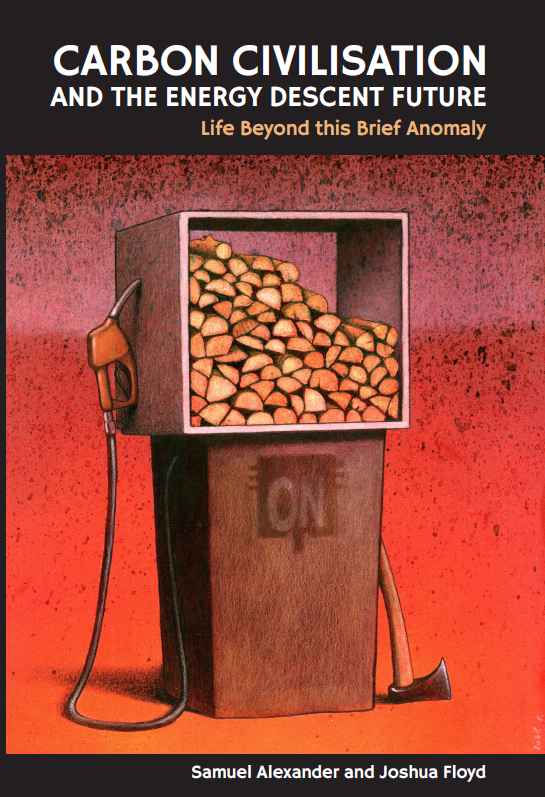 This book examines these issues and presents a narrative linking energy and society that maintains we should be preparing for renewable futures neither of energy abundance nor scarcity, but rather energy sufficiency. For industrial societies, this means navigating energy descent futures. Back in June, Nafeez Ahmed published an article, 3 ways Clean Energy will make Big Oil extinct in 12 to 32 Years — without subsidies, that provoked critical feedback from a reader. True to his stated mission to redesign investigative journalism for the 21st century based on ‘generative dialogue’, Nafeez responded with an offer to run a symposium via his online publication Insurge Intelligence, to explore a wider spectrum of perspectives on his article’s theme. The symposium, Pathways to the Post-Carbon Economy, responds to the framing question ‘how do we transition away from fossil fuels toward societies that are both environmentally sound and prosperous, allowing their members to live fulfilling, meaningful lives?’ So far it has featured eight articles, from Mark Disendorf, Graham Palmer, Saral Sarkar, Ted Trainer, Jonathan Rutherford, Felix Fitzroy and me. My contribution, which Resilience.org also ran as it’s feature article, is reproduced in full below, including Nafeez’s editorial intro. Back at the start of May I was invited to speak at a business networking event run by Moral Fairground on the theme ‘The Unseen Cost of Travel’, alongside Intrepid Travel co-founder Geoff Manchester and Janine Hendry of Reho Travel. The invitation came about as a result of my posts here last year on the climate impacts of air travel. My brief was to cover the implications of carbon offsetting. If you enjoy reading Beyond this Brief Anomaly, please consider making a contribution here to support the inquiry.